Leaders of the Fellowship of Grace Brethren Churches meet at Grace Community Church, Seal Beach, Calif. (Steve Williams, pastor). Leaders of the Fellowship of Grace Brethren Churches (FGBC) are meeting this week at Grace Community Church, Seal Beach, Calif. (Steve Williams, pastor). 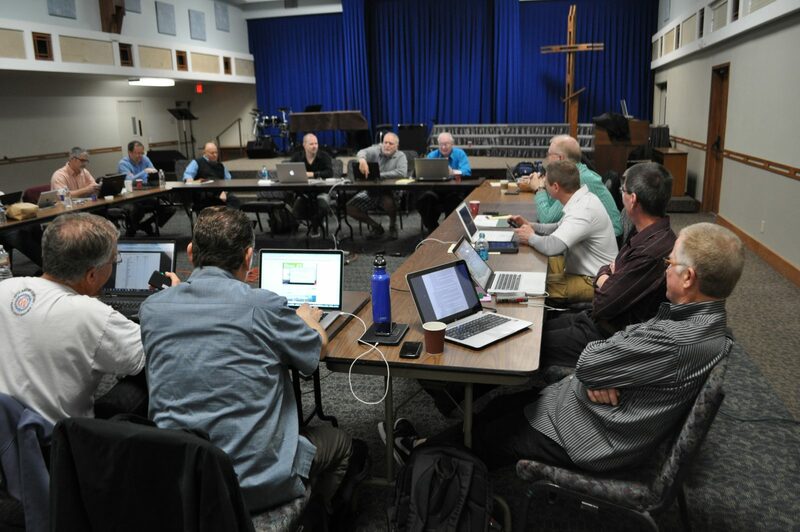 Led by the FGBC executive director (moderator) Bartley Sawatsky, the Fellowship Council is hearing reports from national organizations, considering applications from new churches, and caring for other business that will set the direction and future of the Grace Brethren network. 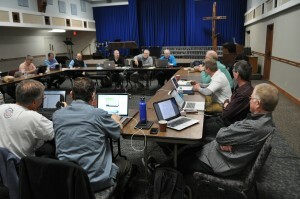 This morning, they hear reports from national ministry leaders. Giving reports were Dave Guiles, Encompass World Partners; Ed Lewis, CE National; Ken Seyfert, Grace Brethren Investment Foundation; Tim Boal, Go2 Ministries; Janet Minnix, Women of Grace USA; Bill Katip, Grace College and Seminary; and Liz Cutler Gates, GraceConnect. Barb Wooler, director of Project Hope and Charity, who is heading a relief effort in the Central African Republic (C.A.R.) also reported on efforts to raise funds for bags of grain to be distributed in the C.A.R.